Abraham Lincoln reportedly said that he wanted to leave the world a better place than when he arrived in it. With God’s help and the generous support of our partners, the White Estate is committed to making the world a better place for Christ. Our life-changing ministry is global in scope yet local in its impact on individuals—“one person at a time.” Outreach. Nurture. Sharing the Vision. What better investment opportunity can there be? Let me share a few astounding statistics about the White Estate’s evangelistic/ nurturing projects. 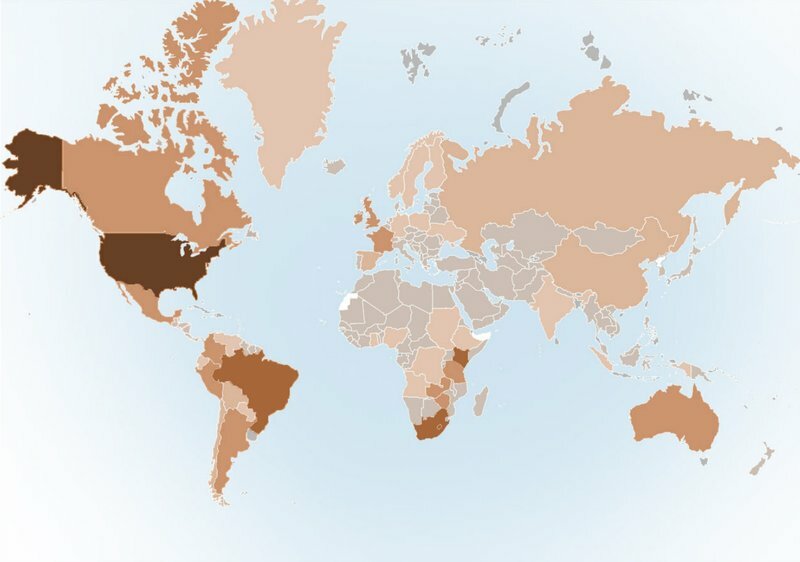 The world map shows digital usage of EGW Writings by country with some 70 million user requests during October 2018 alone. Only 4 small countries worldwide did not access EGW Writings in October! (*) Darker areas represent higher usage. egwwritings.org makes available for free the complete published writings of Ellen G. White, including all her previously unpublished letters and manuscript files. It also contains at least one Ellen White book in 131 languages. We continually digitize non-English books as they become available to us. 18 months ago, the White Estate stepped out in faith and migrated the hosting of our online services from our main office at the General Conference to a new Global Cloud Delivery Network (GCDN). The result: users of egwwritings.org grew from 30,000 unique visitors per month to 1.2 million worldwide! We currently average 70 million “online only” search and book requests per month from our EGW Writings apps and Websites. To keep up with this unforeseen phenomenal growth, we have had to increase our cloud capacity four times during those 18 months, and the demand is forcing us increase that capacity again. In October 2018, users downloaded 1.4 million books to their EGW Writings apps. We currently have 1.8 million EGW Writings users of our Android apps, plus another 750,000 users of our Apple iOS apps. Let’s not forget CD-ROM users of EGW Writings. We still have more than 500,000 of them, and 60,000 users access the EGW Writings apps on their Windows and macOS platforms. Users currently download on average 50 Terabytes of data per month from the EGW Writings apps and websites. whiteestate.org is our legacy Website which hundreds of users and websites still reference. ellenwhite.org is a website for researchers to access tens of thousands of historical resources. We currently average 125,000 monthly whiteestate.org and ellenwhite.org website visitors. The White Estate sends out 130,000 in-app subscriptions daily and 69,000 daily devotional and daily thought emails. At peak times during the day we are delivering 50 subscriptions per second to our subscribers. To assist users, a revised and updated WhiteEstate.org Website launched in November 2018. Our user growth over the past 18 months is 40 times what it was when we moved to GDCN servers, and this exponential growth continues unabated! Server hosting costs have risen 13 times to meet this demand. We need new servers in Asia/Oceania and South America to have adequate capacity for our ever-expanding user base. It currently costs the White Estate $630,000 per year to operate and keep up-to-date our Ellen White Websites and EGW Writings apps. Unfortunately, we only have $400,000 committed for 2019, leaving a shortfall of $230,000. That’s where your investment and mine can make the difference. If every individual user of our egwwritings.org website contributed just 50 cents per year, our entire annual budget would nearly be met. Realistically speaking, that is not going to happen. But many of us can help to make up the difference. If 230 White Estate supporters gave just $100.00 per month next year, we would more than cover our shortfall. Will you help keep our worldwide internet ministry online? In 1849 Dan Palmer, Joseph Bates’s first convert in Michigan to the seventh-day Sabbath, was a generous blacksmith. Whenever he heard of a new way to support the work of God he would say, “I must have an investment in that.” My wife and I are pledging to take the “230 Investment Challenge.” Some can give more; others less, but whatever amount you invest in this project will help supply the world with free access to the inspired writings of Ellen White. (The Publishing Ministry, p. 119).